Repeats every week every Thursday until Thu May 02 2019 . 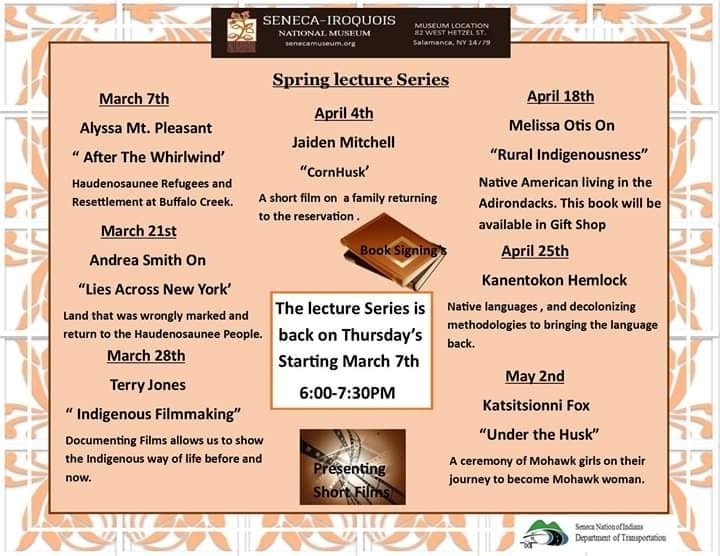 The Seneca-Iroquois National Museum is presenting a Spring Lecture Series, beginning March 7th and continuing through May, with a series of informative, pertinent and timely range of topics. These events are free and open to the public. Each lecture will start at 6pm and generally continue for an hour to an hour and a half. The list of presenters for this year include Alyssa Mt. Pleasant, Andrea Smith, Terry Jones, Jaiden Mitchell, Melissa Otis, Kanentokon Hemlock, and Katsitsionni Fox. See the photo for what they will be presenting on. 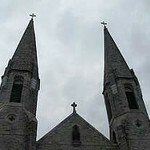 Check out the Museum's newly updated website or Facebook page for updates! The Seneca-Iroquois National Museum is now included in the new Onöhsagwë:dé Cultural Center. Salamanca, NY is the only city in America that is almost totally located on Tribal Territory.